McLean estimated the fire had destroyed thousands of structures, which would immediately vault the Camp Fire into the record books as one of California’s most destructive fires in history. The nine worst fires the state have seen all burned at least 1,000 buildings, with the top three topping 2,000. Regardless of where it lands on the list, it’s clear that the Camp Fire has irrevocably changed the lives of thousands of people who stood—or still stand—in its path. The fire began in the Plumas National Forest, where it was first reported around 6:30 a.m. PT on Thursday. It grew explosively throughout the day as it marched westward. 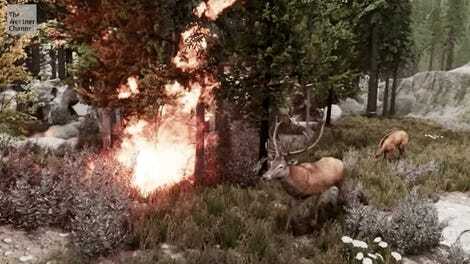 By 9:30 a.m., it had consumed at least 5,000 acres. Eleven hours later, that total was up to at least 20,000 acres, the flames urged on by powerful winds across a dry landscape. The town of Paradise sits right in the middle of the acres burned. As the fire unfolded throughout the day, reports on the police scanner recounted scenes of unspeakable terror. The speed that the fire grew caught residents off guard, and the evacuation slowed to a crawl in some places. 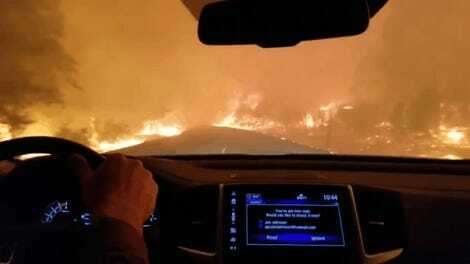 Officials on the scanner reported abandoned cars and people running for shelter in local stores as the Camp Fire bore down on town. Residents confirmed the scenes to the AP. Videos posted to social media show heart-pounding footage of people driving through walls of flame and smoke in an effort to outrace the fire. Local news crews also spotted a fire whirl—the baby but no less terrifying cousin of firenados like the one sparked by the Carr Fire earlier this year—whipping outside Paradise. With firefighters in full life-saving mode, the Camp Fire is essentially uncontained. Reports late Tuesday night indicate that it had jumped a highway and was spreading south and west including toward Chico, a town of 93,000. CALFIRE reports there are still 15,000 structures in harm’s way. “Due to the fluid and rapidly changing conditions, residents are urged to stay updated through official sources for changes to evacuations and road closures,” CALFIRE warned. Because of heavy web traffic, the Butte County Sheriff has been using Twitter to post the most updated evacuation information so if you live there, refresh it regularly. 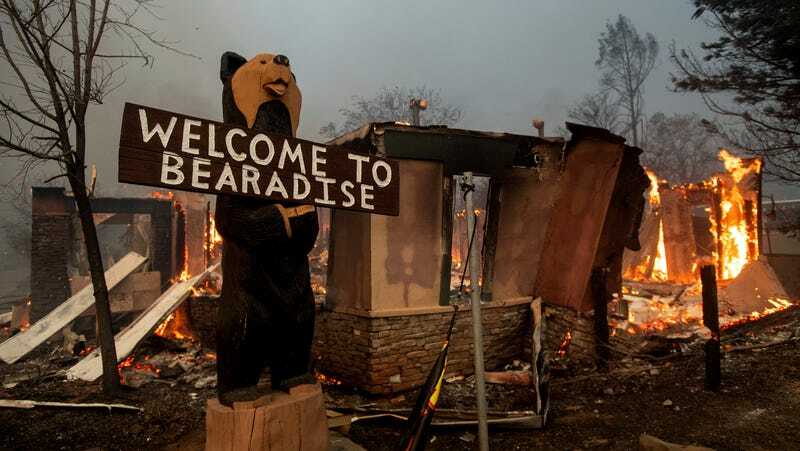 When the flames finally are put out and residents are able to return to Paradise, they’ll find a vastly different place than the one they fled from. And they’ll face a dilemma that more and more Californians have had to face: rebuild or leave. In a world where climate change is making wildfire season longer and fires more destructive, the former is an increasingly harrowing proposition. Update November 9, 1:25 p.m. ET: CALFIRE has released its first damage estimates for the Camp Fire. At least 2,000 structures have been destroyed. That means the fire is California’s fourth-most destructive fire in state history, but here’s the thing: The number will almost surely rise as firefighters get a more details damage assessment. The fire is also only 5 percent contained and could still wreak further destruction. Footage along the roads of Paradise is also starting to come out, providing a glimpse of the unimaginable terror people dealt with while evacuating. Roads are littered with hastily abandoned cars and surrounded by burned out forests. Update November 9, 2:15 p.m. ET: The Butte County Sheriff’s Department has confirmed five fatalities from the Camp Fire. The victims were found in their cars on the southeast side of town and were overcome by the fire. Because of the severity of the burns, the sheriff’s office was not immediately able to identify them. Update November 9, 8:25 p.m. ET: Officials have confirmed six deaths resulting from the fire that ravaged Paradise. According to the Associated Press, it was not immediately clear how the sixth person died. Update November 9, 9:45 p.m. ET: The Butte County Sheriff’s Office has confirmed nine deaths resulting from the Camp Fire. According to the San Francisco Chronicle, these include four people found inside their cars, one person found outside their car, one person found inside a home, and three people located outside their homes. Thousands of homes have been destroyed and three firefighters have reportedly been injured. According to the Los Angeles Times, its widespread damage to homes and commercial buildings makes it the most destructive fire to property in California’s history.